Seraphina is like a YA sleeper hit. You don’t see a lot of blog buzz and hype about it, probably mostly because it was published in 2012. But if you look on Goodreads, you’re going to see that your friends who have read it most likely love it. When I was looking for a new read, I decided on a whim to download the e-book version of Seraphina from my library, and the fact that right after I finished I wished that I owned a copy and that I could re-read it right then means it was pretty special. Actually, the real question is: what was Seraphina’s motivation? About 100 pages in I realized I had no idea what Seraphina’s goal for the story was, thus I had no idea where the story needed to go. She was trying to blend in and not stick out too much, and then Orma was trying to find out about his father/her grandfather, but it wasn’t real clear-cut to me exactly what the plot was. That made it just a little off for me and made the beginning seem slowish (not too much so because I was engaged the whole time, but I felt like I was waiting to find out what the book was about). So I realized once I finished the book (which again, was an e-book) that there was a cast of characters and a glossary in the back. That would have been useful to use throughout since I ended up confused many times about who a minor character was exactly again (they don’t have the easiest names) or what a certain term meant. I did read it after the fact and that helped some, but if I read it again (and in paperback!) I will definitely utilize these tools to help me appreciate the story even more! Wait, dragons can become people? Uh, okay, awesome! For the most part, you can figure things out as the story unfolds and there is really only added backstory/narrative occasionally, which I really appreciated. I loved them individually! I loved their friendship! I loved their *wanting more*! It felt right, and it left me wanting more without leaving me at a cliffhanger. And good news, another Seraphina book is expected to come out next year so I’ll get the more that I want! Yay! Basically, I don’t know what to say. The story is interesting and I just fell in love with the world and the people, and I especially loved Seraphina and Kiggs, and want more of them. This are no adequate words for this review. I had a couple issues (one that could easily have been resolved, so really just one) but overall, it was just great. Just read it. Content advisory: Some mild language, most of which was the correct usage of the word b-stard. Have you read Seraphina? What are your thoughts? If not, what are you waiting for?! 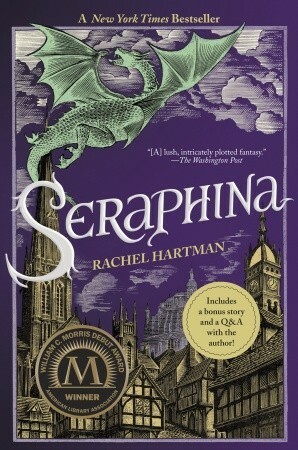 I have been meaning to read Seraphina for a while – with that cover and the synopsis, I seems like a book I would love! And your review just convinces me of that! It’s sounds like a fantastic read! I will remember to refer to the glossary in the back though. I didn’t know it was going to be a series, so that is great news too – since hopefully I will read it just before the next book comes out! Thanks, Charlene! I do think you would love this one! It wouldn’t hurt to wait at this point, but I think you’ll really enjoy it! Sleeper hit is totally a good description for this book. I agree with your assessment! She did a really good job balancing everything! I want to read it and I am so jealous your library has e-copies and whatever. And since it has to do with dragons, your use of How to Train Your Dragon GIFs is just so appropriate. But anyway, I really want to read this book now. If only i could impose on your library. I will say that it is worth buying! I’m probably going to get a copy of it sometime since i enjoyed it so much! When I first heard about this book two years back, I have to admit that I wasn’t really interested because the concept sounded kind of weird and confusing at the same time! But then all the positive reviews started rolling in and now I regret not requesting at ARC so I could read it first, haha. Anyway, I’m still super interested in reading it, so I’m glad that you liked it so much, Amy, despite some minor problems. The lack of direction in a story might bug me a little. :/ I recently read The Vanishing Season by Jodi Lynn Anderson, and the same thing happened to me as well — I had no idea where the story was going, or what its ultimate goal was, and that kind of ruined my experience a little. I like at least having a feel of the story, but there was none in TVS. At least you were still interested, though. For me, TVS was both seemingly plotless and boring at the same time. I barely made it through. Have you read Tiger Lily, also by Jodi Lynn Anderson? Because I felt exactly the same way as you’re talking about The Vanishing Season! Like what is the point… why isn’t this at least interesting… Seraphina was very interesting even though I didn’t know what her goal was. And it’s actually dragons that can turn into people, not the other way around. I hope that doesn’t change your interest in it. I’m not sure about the first GIF, the second one is from the second movie, and the third one is from the first movie.